One of the best features in recent times to be added to computer monitors is the ultra low motion blur (acronym ULMB) which allows the LCD panel to strobe an image instead of having it persist on the screen. How it works is that the image ‘flashes’ on and off (called strobing) instead of redrawing itself while the old image is still present. Even though strobing is how old CRT monitors used to work, it removes the appearance of blur during fast motion. This is especially useful when playing fast-paced games such as FPS games and racing simulations. Download the latest Nvidia drivers for the graphic card attached to your ULMB compatible monitor. Set your refresh rate to 120hz in Windows monitor panel. Using the control panel on your computer monitor, find the ULMB section. Adjust the pulse width of the ULMB to 80. 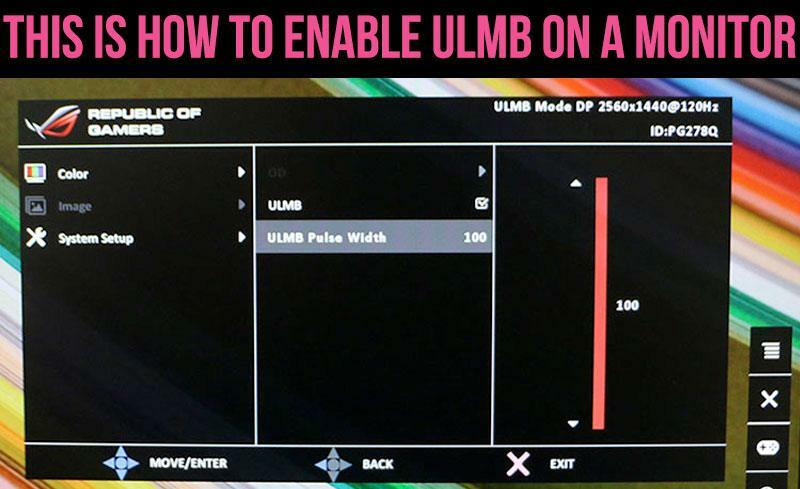 You will know that you have properly enabled ULMB on the computer monitor when the brightness dims a little. Frame strobing results in lower brightness. Make sure that you have a ULMB compatible monitor. Multiple manufacturers such as Asus, Benq (Zowie), Dell, Acer will have the powered by GSync technology sticker somewhere on the screen. (Or at the very least, it will be well advertised when you purchase the monitor). Other gaming monitors can still enable the equivalent of ULMB by using proprietary technology or the BlurBuster’s strobing utility. Typically, if you have a 120hz, 144hz, 165hz or 240hz capable monitor, it will support some level of strobing. Make sure that the monitor is properly set to 120hz. On some monitors, ULMB will refuse to run at 144hz (other monitors will allow it). In general, 120hz is the universal strobing speed. Verify that you aren’t running Gsync. Monitors currently do not support simultaneous usage of both Gsync and ULMB. It’s either or! Make sure to update your graphic drivers. My 240hz monitor required a graphic card driver update to function properly (odd, I know). Eric is the author of Fragging Fundamentals, the ultimate guide to competitive FPS gaming.